Have you ever wanted to buy a technology or consumer electronics product and been stumped about which product is best? Or, worse, bought a product only to learn later that you didn't buy the right one for your needs? I have, and that is why I started TechGearLab. 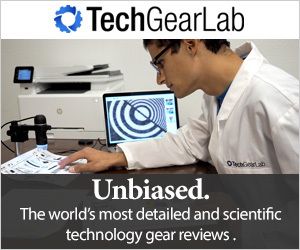 The TechGearLab mission is simple: to create world's best technology product reviews. We believe the world's best tech gear reviews are the ones that help you select the right products for your specific needs, budget, and interests. Our secret sauce is side-by-side comparative reviews. We select the top products in each category. We buy the products we review ourselves, at retail just like you, to help assure complete objectivity and independence in our ratings. We will not accept free evaluation units from manufacturers. Our Review Editors put the products through detailed side-by-side tests, both in the lab and in the field, and carefully assess performance, ease of use, and reliability. After our testing and reviews are finished, we sell reviewed products on eBay at big discounts. TechGearLab is reader-supported. When you click on links to buy products we may earn money to support our work. Your support helps us test more products and stay ad-free. Our review process starts with selection: we look at hundreds of products to determine the top contenders in each category. We then buy the top contenders for detailed hands-on testing. To provide a fair basis for scoring, we develop a set of objective lab tests for each category that will help us quantify important differences between competing products. In addition, we put products through real world field tests where we use and abuse them to see how they hold up to the competition. Our Review Editors come from a science and engineering background, from top schools such as MIT, UC Berkeley, Princeton, and Oxford. Our team brings a thoughtful approach to each review, and the rigor of scientific and engineering standards to product testing and rating. In the end, our mission is to help you find the best product for your situation, keeping in mind that each person's needs are unique. To achieve that goal we publish the scores of each product relative to its competition, both overall and across important attributes for each category. That means you can find the one that best meets your individual needs. You'll find that our Editors' Choice award goes to those products we believe are the very best overall, and you'll learn why we selected them by reading our detailed reviews. Our Best Buy award goes to quality products that offer the most bang-for-the-buck. Our Top Pick award goes to those products that stand out for specific applications, and our review will explain the details of why and what for. Our reviews should provide the information you need to select the right gear for your budget and needs, enabling you to buy with confidence. Our review process takes a lot more work than the typical gear reviews you find online. But we strongly believe that the best gear reviews are those that objectively compare and contrast. When we read reviews, it's not enough just to know if the reviewer liked or disliked the product. We want to know how it stacks up against all the other top products out there, and why one product may be better than another. It's the rigorous style of comparing and contrasting though objective tests pioneered by Consumer Reports magazine that we aim to bring to the tech community. So check out our reviews and let me know if we are living up to our goals. If you have more questions please check out our Frequently Asked Questions or email us. I'd love to hear from you, and especially encourage feedback that can help us improve. You can help us make TechGearLab the world's best source of information for consumer electronics enthusiasts like you. P.S. If you love the outdoors, check out our outdoor gear review website, OutdoorGearLab. OutdoorGearLab applies the same ethics we use on TechGearLab, to create the world's most detailed, scientific, and objective reviews of outdoor products. P.P.S. If you have a baby, you'll enjoy our sister site, BabyGearLab, which reviews baby products. While I'm not personally involved with BabyGearLab, both sites share a similar commitment to side-by-side comparison reviews, and use the same underlying technology platform.